Mount Dana Trail in Yosemite National Park is a 6.75 miles route located near Groveland, California. This route features forest and lake, and is rated as hard.This route is used for outdoor. Although there is no official trail up Mount Dana, a fairly well defined use trail climbs to the summit. This path starts at a small parking area for official vehicles adjacent to the Tioga Pass Entrance of Yosemite National Park. At the beginning, the path is fairly level as it passes through forest. In this section, you will pass a few very scenic small lakes and some wildflowers after the snow melts. Soon enough, the trail starts to climb, and climb STEEPLY. It doesn’t take too long for the trail to climb above the timberline. When this happens, the views REALLY start to open up and get more spectacular as you climb more and more. Eventually, you reach a plateau area about midway through the hike. Some of this plateau is grassy, but most is quite rocky. But given the views and the otherworldly look and feel of the immediate surroundings, it is all spectacular. Eventually, however, the climbing resumes. Although many will say the trail disappears in the final climb, it is actually quite well defined. At least when all the snow is melted. If you DO end up losing the trail, simply look for the large rock cairns which lead the way up to the summit. The climb here is pretty steep. And if you are sensitive to altitude, it can start to affect you here, as you are now above 12000ft. But soon enough, you reach the summit. It is hard to say what is the most spectacular summit in California (or even Yosemite). But Mount Dana HAS to be up there. Most notable is the view of Mono Lake, over 6000 feet below you. Tuolumne Meadows spreads out to the west. And to the north and south, you are surrounded by other high peaks in the Sierra. Enjoy the view for a while, and head back down the way you came up. The Tioga Pass Entrance Station is the primary entrance for travelers entering Yosemite National Park from the east on the Tioga Pass Road. Open only during the summer months, the entrance station consists of two historical buildings, a ranger station and a comfort station, built in 1931 and 1934 respectively. Tioga Pass (el. 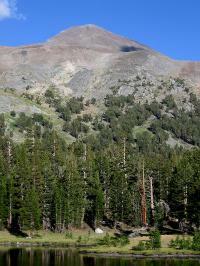 9,943 ft. / 3,031 m.) is a mountain pass in the Sierra Nevada mountains of California. State Route 120 runs through it, and serves as the eastern entry point for Yosemite National Park, at the Tioga Pass Entrance Station. It is the highest highway pass in California and in the Sierra Nevada. Mount Dana is a mountain in the U.S. state of California. Its summit marks the eastern boundary of Yosemite National Park and the western boundary of the Ansel Adams Wilderness. At an elevation of 13,061 feet (3,981 m), it is the second highest mountain in Yosemite (after Mount Lyell), and the northernmost summit in the Sierra Nevada which is over 13000 feet in elevation.